The report is published by International Monetary Fund (IMF). Global growth for 2018 is estimated at 3.7 % as in October WEO forecast despite a weaker performance for Europe and Asia. 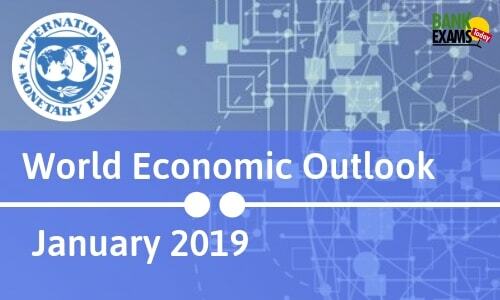 The global economy is projected to grow at 3.5% and 3.6% in 2019 and 2020 respectively. Risk to global growth tilt to the downside. The main shared policy priority for countries is to resolve cooperatively and quickly their trade agreements and resulting policy uncertainty. Of all economies, measures to boost potential output growth, to enhance inclusiveness, and to strengthen fiscal and financial buffers in an environment of high debt burdens and tighter financial conditions are imperatives. The financial policies of advanced economies out to still normalize carefully by taking necessary steps to address the slowing growth momentum. The IMF additionally advocates for measures spice up potential output growth and enhance inclusiveness across all economies to broaden the growth. The report retained India’s growth projection at 7.5% for 2019-20 and said that it is likely to accelerate to 7.7% in 2020-21. India to remain the fastest growing economy in the world at least for the next two years.